the problem that I have is how to settle the header and footer groups to get the results, I hope you can help, thanks in advance!! 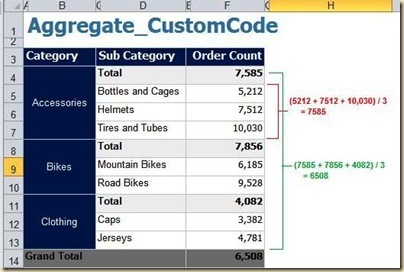 Are you using SSRS 2005 or SSRS 2008? Hi Jason, I have a question. What if I have various columns holding values and I need to get a total at the bottom? My issue is that my sp is bringing in say, 100 values, but in my report i am rendering the top 25 values….however, my bottom total is totaling my 100 values, and my totals are obviously off. With your previous mentioned solution, I get a grand total of all of my columns…is there a way i could break that up into each individual column to have different totals at the bottom? Did you ever figure this out when it's spread across multiple pages? Hi, I found the solution after searching far and wide. Don't set the =Code.AddTotal(Avg(Fields!Order_Count.Value)) in the textbox value, but instead put it in a groupings variable. Mail me at jason143@gmail.com with the report rdl and an explanation of what you are trying to achieve, might be able to help you. This code solved my problem but I had to modify I a bit because it was rounding up (105.5 was returning 106) when precision was needed. I didn’t need the averaging, only need the sum of sums in a group. I replaced decimal data types wherever integer was used and this eliminated the rounding issue – at least for me it did. Thank you Jason, brilliant!